A few years ago I worked on a project where the owner wanted an all white hotel which was a bit of a complication because the company he had chosen to run the hotel was Chinese... and white is the color of death over there. So here are a few other meanings of what this color represents. White is the bridal color not just in Western civilization but also in Japan where the white represents the purity of the body, and in Japan means the death of their former family and entering a new one. White's sister color is black and they always represent the extreme oposites of everything: day and nigt, good and evil, white magic and black magic, opnennes and closeness. One of the best examples of this dulity is the ying and the yang in which each color is oposite to each other but also complementary to each other. White sanded beaches are the most popular vacation destinations as they are usually ocated in exotic islands where the water is clear. The best thing about white sand beaches is that they are usually much cooler than those with dark colored sands which helps a lot when spending the day at the beach. According to Pantone, white t-shirts are the most commonly sold apparel item in the US... but I would not stop there, I'd say that the white shirt is up there with the t-shirt. During the summer months you can also add white shorts and sundresses as the most commonly used pieces of clothing. Have a great day the weekend is almost here! Oh man, white beaches are my favorite! Love how cool they feel on my feet. That's true about white in Chinese cultures. In traditional Chinese weddings, the bride wears red. And yellow is the colour of royalty. But I definitely am guilty of buying many many white t-shirts in different styles. It probably makes up 1/3 of my closet! great photo with the mirror! This makes me think I should reconsider my stance on white clothes - they look so nice, but I'm a klutz and wearing white makes me nervous. This is such a lovely post–I adore color meanings in other cultures! well, to be fair, this comment IS coming from amagansett, so white linen is kind of standard uniform. You got such a lovely blog full of inspirations & great pictures! I love these types of posts, they are always so interesting. I had no idea that the colour white was associated with 'death'. I only know it to represent angelic types and innocence. Good post! Very interesting! I love white decor. White chairs, white couches, the whole deal, but just not practical for a klutz like me! 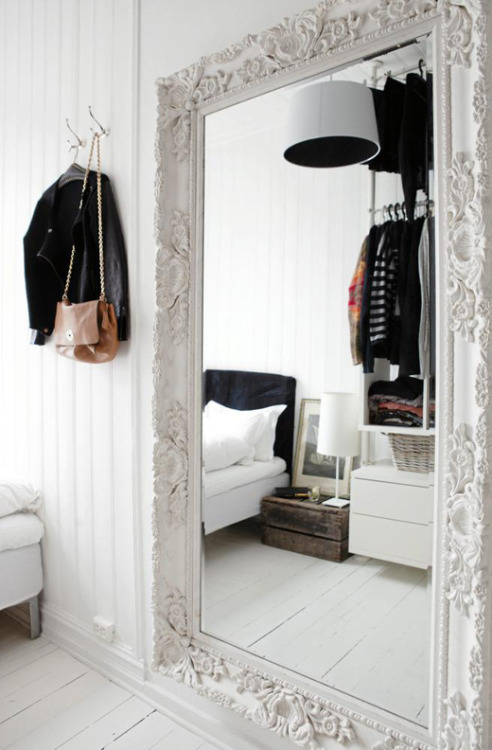 Lovely post, love the white mirror! White has slowly become my favorite color. I think it's because I live in the harsh heat of Phoenix. My closet is slowly being taken over with white shirts! Love white, and I literally bought something like 5 different styles of white tees this week--haha, I guess I went overboard! Happy early weekend Elie, hope you have a good one!!! HaHa I didn't know some of these things! Thanks for explaining and sharing! :D Some people are not mindful of other cultures customs. I love that last picture of Garance. Thanks for all the facts, i had no idea!